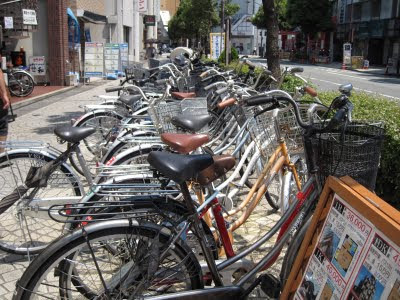 One thing I both really like and dislike about Japan is all the bicycles. Everyone and their grandmother's got one, literally. On one hand, it's good exercise and better for the environment to ride a bike instead of driving. And they are well-suited to Japan, as the roads are generally congested enough as it is. Bicycles can be easily maneuvered down tight streets that cars have trouble with. On the flip side, a lot of people riding bikes means that sidewalks near shops are often crowded with parked bicycles. You also have to be a lot more aware, whether you're on foot, driving, or on a bike of your own. Even though most bikes seem to come pre-made with squeeky breaks, bicycles in general are still fairly silent, so if you're not careful you can wind up, oh, hitting someone with your motorcylce, for example, and then paying their medical bill and court-ordered damages until they luckily change their address and forget to get in touch with you about where to send their money. You got off easy this time. Bicycles are fun, except I'm scared to ride them on big hills because I always think I'm gonna fall off at the end of them and spill my brains out. Thoughts? I would have sent it to you on gchat but you're not online right now. I cringe when I see a momma with 2 or 3 little kids on the same bike. Like my most ghetto image of Vietnam right in the middle of an affluent Tokyo neighborhood. @Andrea - Thanks for the link; hadn't seen that article, although there are some on that topic at Japan Probe. I'm personally not too happy about the campaign. I'm not quite sure what McDonald's is thinking, being such an international company. @Billywest - Yeah, it's weird, right? They are good at it, though. Never ceases to amaze me - seeing a woman with a kid or two attached to her bike, riding while simultaneously using her cell phone and/or holding an umbrella.